Evolve into the cheerleader you always knew you could be! 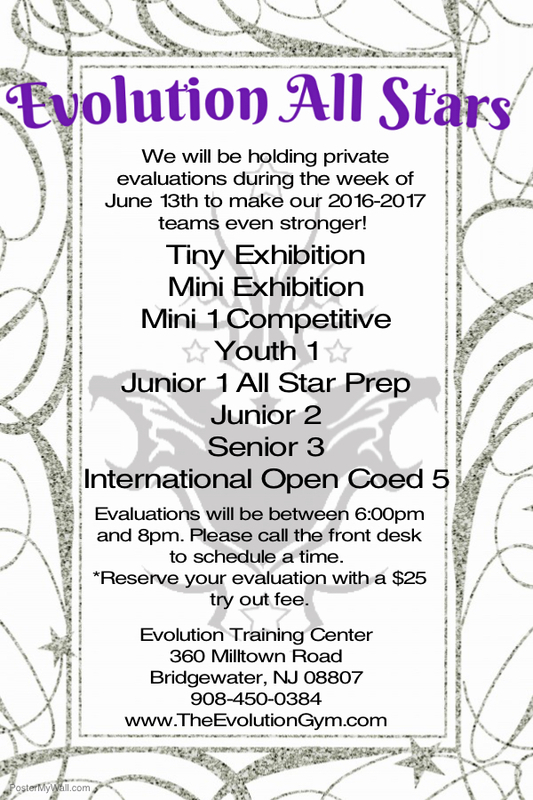 Click here to receive more information from Evolution All Stars. We will email you the tryout packet, as well as a pass for a free open gym for you and your athlete to tour of our gym and meet our coaches! We look forward to meeting you! Call us at 908-450-0384 today with any questions! We offer many different levels of team including our full year competitive all star teams from level 1-5, all star prep teams with lower time commitments, and our tiny team for athletes ages 3-6. We would love for you to come check out our teams with a personal open house tour. 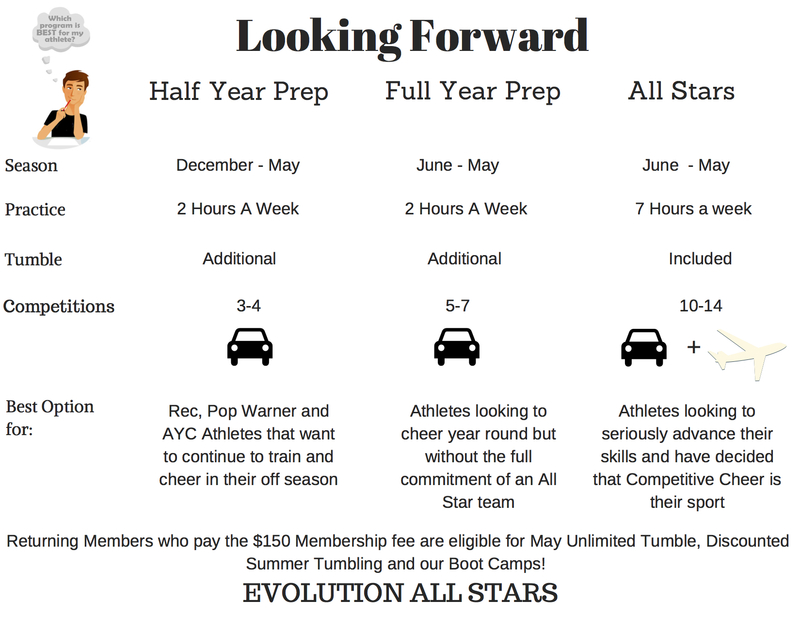 An introductory team-training environment with one practice a week plus an optional All-Star team tumble class. This team will exposition some level 1 skills 5-7 times a year locally and the season runs September through April. A perfect place for a young athlete to learn and develop the basic fundamentals of the sport and learn to execute a routine. Not sure if your athlete is Tiny or Mini ready, click here for a comparison. Train full year at the top of the sport. In season athletes train 7.5 hours a week over three days and compete 10-12 times locally, regionally and nationally and the season runs June through April. Evolution is very proud to enter the World’s arena this season with the creation of our IOC5 team. This team is built to train athletes looking to advance their skills and attract athletes with ready to compete “plug and play” skills at the same time.For IOC5, the team pricing is Al A Carte, making it affordable for level appropriate athletes who are looking to compete. Every athlete is expected to have the required skill to contribute to the routine. The team is open to all level 5 athletes who are 14 years of age and older.The team has a core group of skilled and dedicated athletes already in place and will be training throughout the summer on Thursday nights, receiving choreography in the fall and will start competing in the winter. *Summer months- There are very few weekend commitments during the summer months of July and August. Full year athletes do enjoy family vacations and summer down time. **Looking for a first experience class? Be sure to ask about our Learn to Cheer program and week-long Cheerleading and Tumbling Summer Camps. Our coaches know each of our athletes and what motivates them to be great! Call today 908-450-0384 and watch your child make friendships that will last a life time while increasing their skills and building confidence!